Built by Knauf-Koenig Group, the home sits on one-third of an acre with ideal southwest exposure, and beautiful views which set it apart. “As with any KKG home, the uniqueness is evident throughout in the woodworking, custom finishes, and attention to detail. This home has all that and then adds an indoor/outdoor lifestyle with amazing views of Venetian Bay,” explains Matt Knauf, CEO, Knauf-Koenig Group. COVER PHOTO: An unusual Davanti mahogany entry door with alternating horizontal glass and wood panels provides a focal point for the clean, airy lightness of the entire exterior. The approach to the four-car side-entry garage deliberately breaks with the formality of the typical driveway. Pavers in vanilla, caramel and charcoal are broken by meandering borders of natural grass, blurring the lines between landscape and motor court. ABOVE: The great room features an oversized cocktail table with inlaid white onyx top and hand-forged steel enclosed base. Crushed velvet occasional chairs are positioned with twin 6-foot Chesterfields with nail-head trim in off-white textured linen. Silver-gray velvet cushions and coordinating throws complement the furnishings and the hand-knotted Persian rug. The original painting is by Anna Rac. The 25-by-30-foot living space is crowned with a beautiful painted wood box beam ceiling with tongue-and-groove insets. 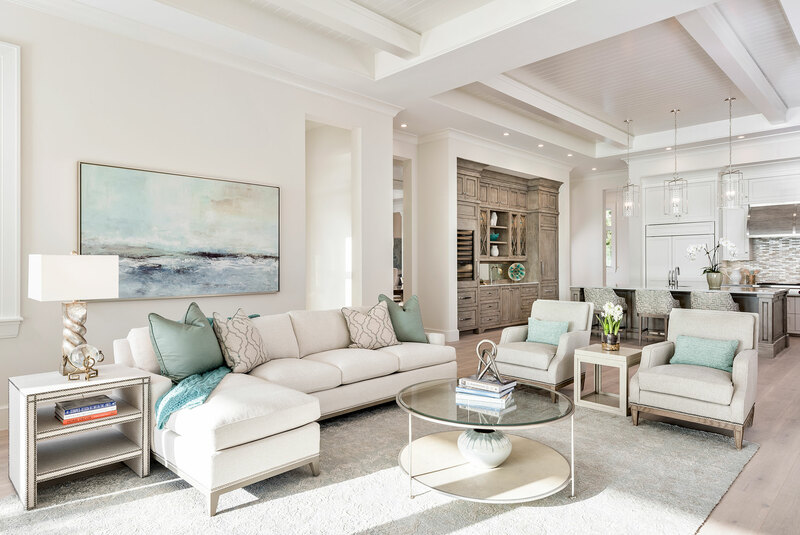 “The custom ceiling design and trim work throughout the home is a Knauf-Koenig Group signature feature,” says Nick Radick, Director of Marketing for KKG. ABOVE: The gathering room, a welcoming extension of the kitchen, features a comfortable, streamlined sectional sofa with chaise in a cream textured fabric and custom pillows that add just enough color. A round glass cocktail table with shagreen base sits atop a beautiful handknotted rug in a silver gray tone. The Legno Bastone European white oak flooring from Naples Flooring is carried through the room. A pair of contemporary style chairs complete the space. ABOVE: An original oil painting by Roy and Amanda Clark creates a brilliant, water-influenced focus for the dining room. “Our goal was to accentuate the incredible view and to draw one’s eyes toward the water by choosing a neutral color palette with accents in vivid ocean hues,” notes designer Tatum Johansson. A trio of pale green recycled glass chandeliers highlights a generously-sized custom dining table in a satin driftwood finish. 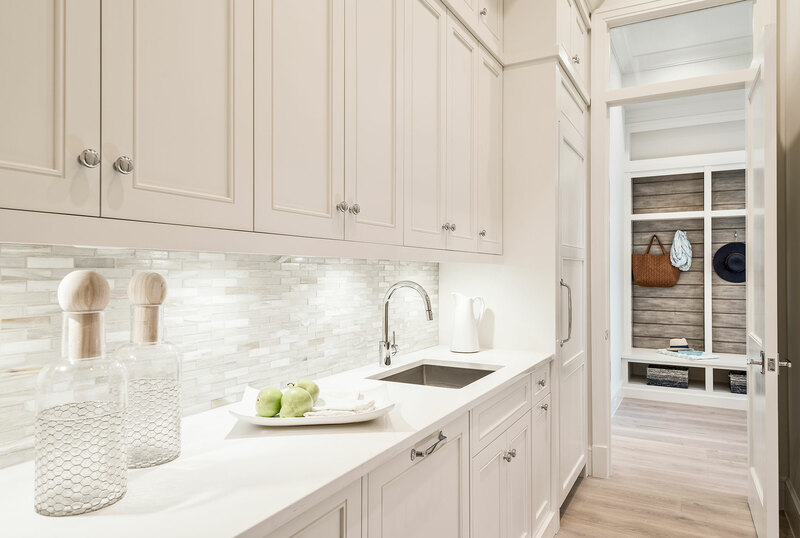 ABOVE: The generous kitchen island in a driftwood-inspired finish and ivory perimeter cabinetry is by Ruffino Custom Cabinets. 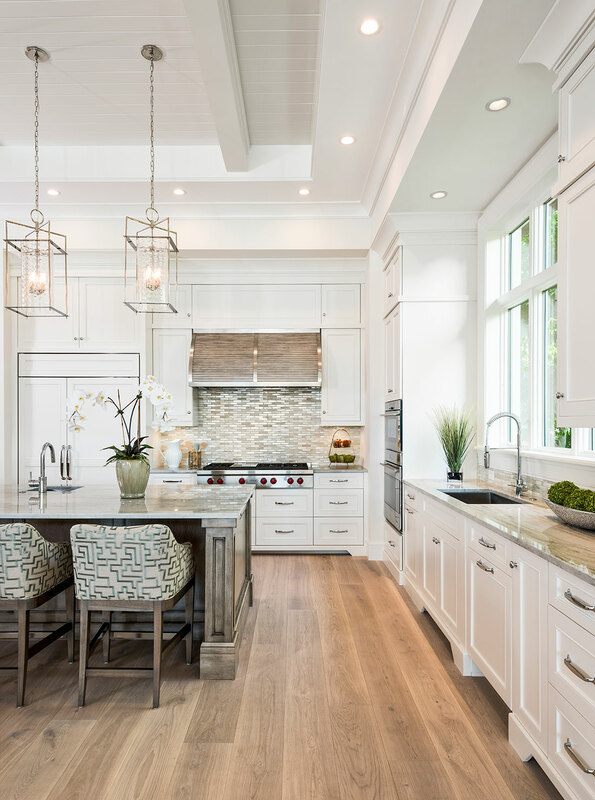 Topped with Sea Pearl quartzite, the island is complemented with pendant chandeliers finished in polished nickel. Counter stools upholstered in linen fabric with a sea green embroidered pattern coordinate perfectly with the kitchen’s glass accent tile backsplash and driftwood and polished chrome hood. Sub-Zero and Wolf appliances are from Ferguson Bath, Kitchen & Lighting Gallery. ABOVE: The ocean-and-sea spray color palette in the master bedroom brings the bay view indoors. A handsome seascape, custom-framed in champagne gold- painted wood sits atop the channel-back headboard and base, in tufted off-white and gray fabric accented with nail-head trim. The tufted bench is upholstered in a nubby, tone-on-tone, warm white velvet. A cylindrical Capiz shell side table with an iridescent mother-of-pearl quality flanks the ivory side chair. The rug is hand-knotted Persian wool in aqua and taupe. ABOVE: The master bathroom is a symphony in calming white-on-white. Sherwin Williams Modern White accents the walls, while Alabaster White moldings are reflected in the Bianco Dolomiti marble flooring. Ruffino Custom Cabinetry vanities blend into the surround, adorned with Emtek pulls in crystal and polished nickel. The Kohler Reve freestanding bathtub and Kohler Ladena sinks are fitted with sparkling same-brand faucets. The picture window framing the tropical green in the side yard is the only touch of color contrasting with the pure white of this tranquil space. ABOVE: This second-floor family and media room opens to a balcony with grand views overlooking the bay. Grays and charcoal in the abstract rug are repeated and complemented with tones of slate, navy, and teal in the ottomans, artwork and pillows. The U-shaped sectional with double chaises provides comfortable seating in this family-friendly space. The Lucite-topped martini tables coordinate with supports of the same material on a contemporary round walnut cocktail table. A trio of ottomans provide additional kid-friendly seating. ABOVE: The stained-cypress vaulted ceiling on the lanai contrasts with ivory-brushed shell stone pavers. “Knauf-Koenig Group’s finishing work stands apart,” notes Debra Lysy, Design Director, Calusa Bay Design. 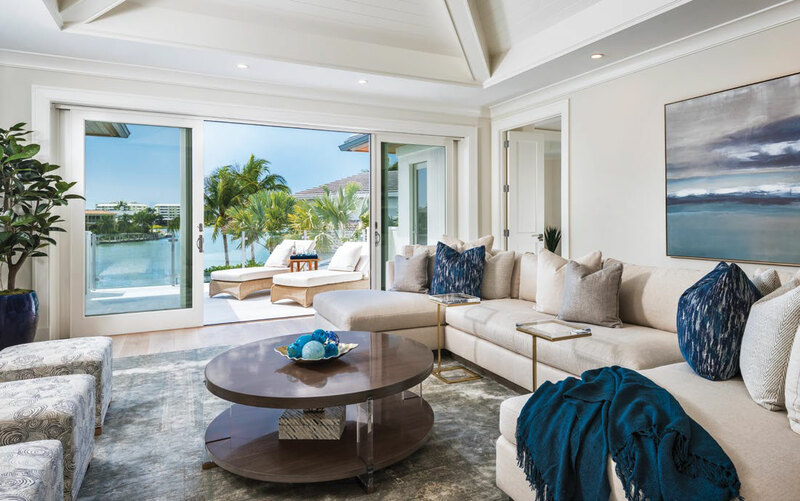 “It provides a perfect accent for this beautiful, custom-furnished home.” A linen-colored, woven wicker sofa and pair of lounge chairs, cushioned in lighter Sunbrella fabric with hexagonal-patterned pillows, provide the perfect place to sit back and enjoy the view. Teak coffee and side tables repeat the warm tone of the stained cypress. ABOVE: A generous pool and sunset deck facing the bay provide a stunning vista from inside the home. Shell stone pavers surrounding the pool give way to Ipe decking, leading down to a grassy edge—the ideal spot for a future dock or boat slip. The infinity pool with waterfall is shaped and placed to optimize the long water view of the bay. A raised, heated, and illuminated spa and sun shelf complete this exceptional outdoor venue.